I heard that over and over when I explained to notable foodie southerners that the Burrito Bracket would include 16 burrito-selling establishments from Dixie. Tamales, tacos, Frito pie — they’re all Mexican (or Mexican-inspired) dishes mentioned as worthy of study by scholars and food experts. But folks were incredulous that I wanted to talk about burritos in the South, where they are a) inconsequential to an important food scene and b) often not very good. Despite the lack of local enthusiasm, we were determined to find 16 worthy contenders to represent the region in our search for America’s best burrito. We’d formed a Burrito Selection Committee comprising chef David Chang, academic Jeffrey Pilcher, Mexican-American food expert and journalist Gustavo Arellano, food critic Bill Addison, FiveThirtyEight editor-in-chief Nate Silver and me. We’d sequestered ourselves in a conference room at New York City’s Chelsea Piers to vote on the top 64 burritos in the nation. We were armed with reams of review data from Yelp and oodles of personal and expert knowledge, but the South seemed to be our collective blind spot. It has the fewest burrito-selling establishments (BSEs) of any of our four regions (9,517, according to Yelp, compared to a whopping 26,911 in California alone) and lower Value Over Replacement Burrito scores across the board. 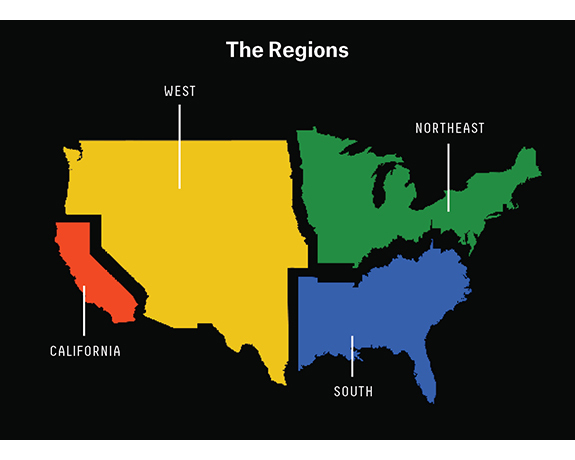 (See this footnote for more about VORB.1) The potential for hidden gems is great, but as a region, the South is known for its food and that food most definitely doesn’t include burritos. Nonetheless, Southern regional BSC representative Bill Addison arrived with enthusiasm and a list of names. Now the restaurant critic for Eater, he has worked for outlets in Atlanta and Dallas, but also the country’s burrito mecca, San Francisco. His first assignment as a critic at the San Francisco Chronicle led him on an odyssey to find the best taqueria in the Bay Area, where he ate 100 burritos and 300 tacos in just 10 weeks. He’s earned his chops in what most would consider the burrito capital of the world, but also has a deep knowledge of food south of the Mason-Dixon line. Vast stretches in the South didn’t seem to have anything in the way of burrito prowess — Mississippi, Georgia (other than Atlanta), Florida north of Miami, South Carolina. … None of these areas presented promising options on Yelp, nor could our well-traveled Burrito Selection Committee members dig up potential candidates. Unlike in the other regions, top options were often nestled in the suburbs. The BSC members created cheat sheets for their regions; these curated lists were shared with the group in advance of our meeting. Addison’s strayed far from the Yelp data. 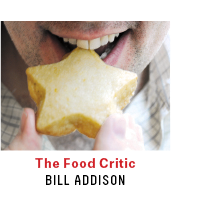 He told me that in his professional life, he uses Yelp regularly — to find hours of operation, addresses and phone numbers, but never to judge the quality of a restaurant. He proposed several restaurant options from the dredges of the Yelp list and produced a list of Burrito Bracket candidates both bizarre and exciting. Three of the top four seeds came relatively easily. Addison swears that Bell Street Burritos in Atlanta is the best burrito in the South (and the Atlanta native swears it’s not a homer pick). The BSC respected Addison’s expertise and seeded it No. 1. He also spoke to Texas restaurant critic, food adventurer and restaurateur Robb Walsh, who recommended a relatively new and obscure food truck in Houston called Breakfast Burritos Anonymous. The BSC agreed nearly unanimously that despite a low VORB, if Walsh thought it was the best burrito East Texas had to offer, that burrito deserved a seeded entry to the bracket. Carrburritos in Carrboro, North Carolina, was placed at No. 3. It has a decent VORB, it’s a college-town favorite, Addison vouches for it, and online reviews from a variety of sources applaud its use of local ingredients. The final seeded pick was much tougher. The first round of voting produced Tortilleria y Taqueria Ramirez in Lexington, Kentucky, potentially giving it a seeded seat in the bracket. This obscure restaurant in an ethnic food corridor in the city came by recommendation from BSC member Gustavo Arellano, author of the syndicated column “Ask a Mexican.” But Burrito Bracket creator Nate Silver, whom we call El Padrino, gave a compelling speech about why at least one top Yelp pick deserved a seed in the bracket. This was a theme throughout the day — the BSC was intrigued by obscure restaurants, and Silver touted the potential insight of what he referred to as “the consensus,” meaning Yelpers. Garbo’s Grill — a food truck in Key West, Florida, with the highest VORB in the region — was moved to No. 4 (though Addison preferred the other Key West option, Bad Boy Burritos), and Tortilleria y Taqueria Ramirez slipped down to the unseeded section of the bracket. The 12 unseeded BSEs include the greatest hits of Yelp and some relatively unknown places that Addison brought to the table. I was skeptical of another Addison suggestion, Mr. Taco in Miami Beach. Miami, referred to locally as La Republica Independiente de América Latina, is my home base. It has decent offerings from just about every country in the hemisphere except Mexico (and maybe Canada; there’s no poutine in Miami as far as I know), so I was hard pressed to believe good Mexican food was hiding in my backyard. But in the end I was outvoted. From there, we found ourselves committing a little bit of burrito affirmative action. With limited great burritos in the region, we decided to give some far-flung local favorites a chance. El Rio Verde in Tulsa, Oklahoma, received marks for having the only notable wet burrito in the South. Mi Casita in Longview, Texas has an absurdly named “Chuck Norris” burrito, which sounds frightening, but the Internet loves it.2 Maybe Morgantown, West Virginia, knows more about burritos than we suspect? In went Black Bear Burritos. That restaurant is part of an interesting trend Addison detected during his search. In the early 1990s, “world food” restaurants opened all over the country, promising culinary adventure and enlightenment wrapped up in a tortilla. While that moment has mostly passed elsewhere, Addison noticed that it seems to be hanging on in the South. Raging Burrito in Decatur, Georgia, was popular enough that it had several locations in its heyday, with a burrito menu that includes Tokyo Teriyaki, Bangkok, Jamaican Jerk and Cajun. Now it’s back to just the original storefront, and it made the cut. “Though I don’t want to eat a Bangkok Burrito with Thai peanut sauce, I do applaud their carnitas,” Addison said. Another Yelp favorite, Flaming Amy’s Burrito Barn in Wilmington, North Carolina, features a surprisingly similar menu, and was also voted in. The BSC talked about including Blue Coast Burritos, which Addison described as a chain that serves burrito-barren areas of the South. While we applaud the public service, it didn’t quite make the bracket. Baja Burrito in Nashville is the longtime favorite of the local alt-weeklies, but may just be the only decent burrito joint in town. Salsa Limón in Forth Worth was Addison’s top choice from his days at the Dallas Morning News. And given that New Orleans is a culinary mecca, we had to create an opportunity for the cajun-inspired creations at Juan’s Flying Burrito. The rules for the BSC meeting allowed for lobbying before the final round of voting. Silver felt strongly that since the South had so few obvious burrito options, BSEs with really high VORB scores deserved a place at the table. 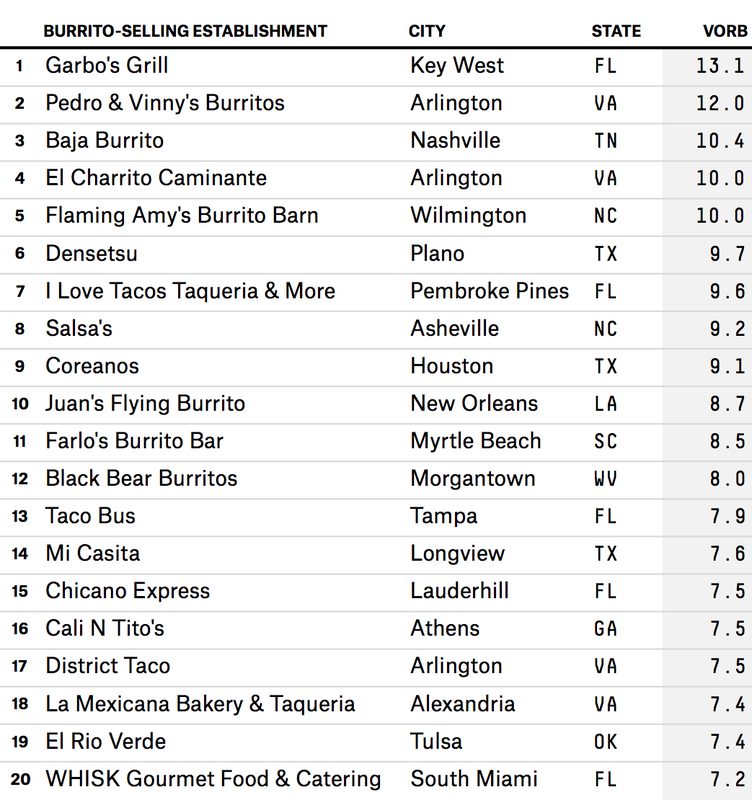 Specifically, he wanted Pedro & Vinny’s in Arlington, Virginia, on the list since it had the second-highest VORB in the region. We didn’t dare defy El Padrino. Value Over Replacement Burrito accounts for quality and quantity of Yelp reviews, while adjusting for location. More on that in Silver’s Burrito Bracket Manifesto. As a bonus, its inclusion in the bracket gave me the opportunity to check back in on the dormant Chuck Norris Facts meme: Jesus once saw the face of Chuck Norris in a microwave burrito.